If you are already a volunteer contact us whenever you need more petitions. Also, you can download additional copies of the Certificate of Circulator ‑ WTP Maine or the Instructions to Circulators Rev 207 2013 from the links above (to the right of the picture of volunteers) as needed. 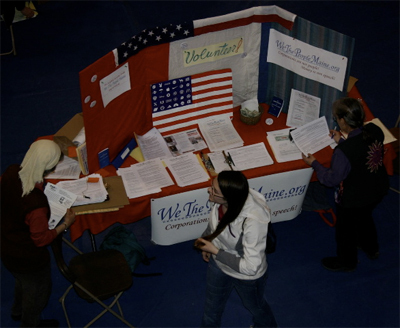 If you are not yet a volunteer, you can help We The People Maine amend the U.S. Constitution and overturn the disastrous Supreme Court's decisions in Citizen’s United v. FEC and McCutcheon v. FEC. To make “corporations are not people” and “money is not speech” a reality, We The People Maine needs volunteers. You can help. Passing the Citizen Initiative is fundamental. Without a constitutional amendment, big money will block every step Maine citizens try to take to create a better, more human Maine, a better, more human United States of America, and a better, more human world. Democracy works if you work for Democracy!